Currently, the majority of our training events are requested directly by schools, colleges or councils. 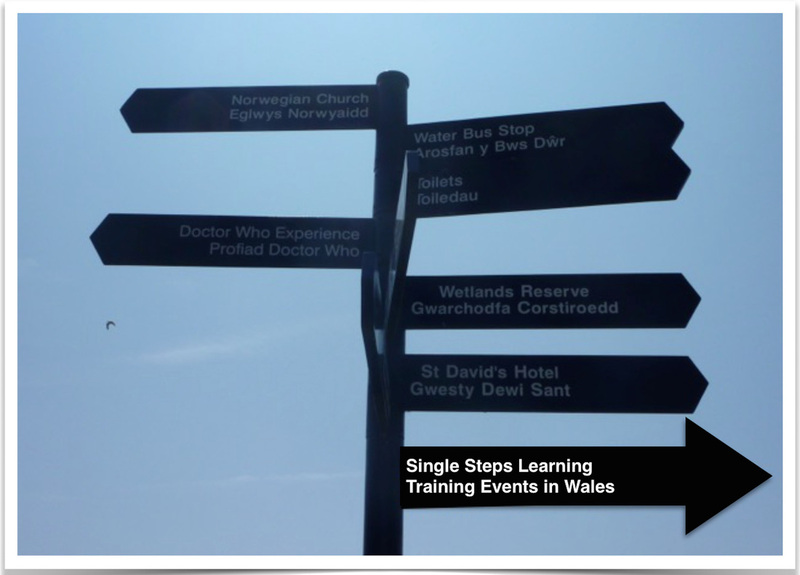 However, from 2016 onwards, we expanded our services and offered a series of training events and education courses at a venue in Wales. Individuals are able to apply to attend these training events. We are committed to supporting the development of education in our own locality. 'Designing for Learning' is grounded in the pedagogies identified in 'Successful Futures' (Donaldson, 2015), which in turn will underpin the development and implementation of 'A Curriculum for Wales'. If you would like to receive information about these events, please register your interest by completing the online form. Single Steps Learning will never pass on or sell your details to any third party company or organisation. Please feel free to download our flyer to access a copy of the 'A Curriculum for Wales: BIG PICTURE' (as seen above). This document contains a two-page aide memoire of what we feel are the key messages/principles of ‘Successful Futures’ (Donaldson 2015). We hope you find it a useful reference. FOCUS: Infusing 5 Key Concepts into designing for effective learning - Community Learning, Quality Learning, Experiential Learning, Problem-Based Learning and Reflective Learning. Developing attitudes, skills and knowledge to be successful in school, the world of work and life. FOCUS: This event focuses on developing leadership; reflecting on current practice and considering wider perspectives; leading the successful embedding of ‘Designing for Learning’ as a whole school priority. FOCUS: One day event specifically focused on giving and receiving effective feedback. This event encourages reflection upon and sharing of current practice, engaging with wider perspectives and considering tools/techniques for future development. FOCUS: Designing collaborative, problem-based tasks that engage and motivate learners. A particular focus can be requested e.g. designing problem-based 'rich' tasks that enable learners to apply literacy and numeracy skills across the curriculum. FOCUS: An 'experiential' day that focuses on the use of 'community building activities'. Participants will engage in a variety of tasks and games that can be applied to different age ranges and curriculum areas. The purposeful placement of these activities can address 'potentially serious' community issues in a less-threatening way. Step 2 is the second part of the full Designing for Learning Training Event. It is beneficial for the same Step 1 Cohort to attend Step 2 together in order for optimum continuation and progression, sharing of experiences based on Step 1 and the development of a professional network. Focus: Deepening understanding of the 5 Key Concepts - Community Learning, Quality Learning, Experiential Learning, Problem-Based Learning and Reflective Learning. Developing attitudes, skills and knowledge to be successful in school, the world of work and life. Moving from breadth to depth, challenge and application.